Since its inception, J. Hunter Pearls has worked in close partnership with local communities on Vanua Levu, Fiji’s second largest island, to produce its prized pearls, thereby ensuring that the benefits are spread all around. In addition to paying yearly leases to traditional fishing rights owners where the company’s two pearl farms are located in Savusavu and Kioa, the company provides much needed jobs for local people and scholarships to deserving students. This gives them the resources to improve their villages whilst still retaining their traditional way of life. A big part of the brand’s philosophy and day-to-day business practice is the protection and preservation of the natural environment – the source of J. Hunter’s astounding pearls. To ensure the nutrient rich bays stay pristine, the company adheres to a strict environmental code of practice, which has had the added benefit of increasing fish stocks for local communities, who rely on fisheries for food and income. J. Hunter Pearls has come a long way from its very humble beginnings on a remote coastal township in the South Pacific. Today, it can be found alongside some of the leading luxury jewelry brands worldwide. And we like to think the beauty of our pearls is more than skin deep. For, besides their unique, natural hues – unmatched anywhere in the pearling world – it is the story of how they are grown that truly sets them apart. Spectacular Savusavu Bay, located on the island of Vanua Levu in Fiji, provides the perfect environment for creating some of the world’s rarest and most precious gems of the sea. J. Hunter Pearls proudly produce Fiji Pearls renowned for their magical radiance and beautiful hues of soft pastels and exceptionally bold tones. J. Hunter Pearls are exclusively available in the J Hunter Showroom in Savusavu town, Prouds stores throughout Fiji and selected resort boutiques. Founded by Justin Hunter in 1999 and farmed in the pristine waters of Savusavu Bay in Fiji. One Hundred Sands is a premier international hospitality firm with headquarters in Fiji. We have been granted an exclusive 15-year gaming license to be the only casino operators in Fiji and will soon break ground to develop a 5 Star Casino Resort on Denarau Island and another Casino in Suva. Tailor Made Fiji design Fiji travel plans tailored to the unique preferences and needs of their clients. Based in Fiji, the Tailor Made Fiji team are uniquely positioned to review and connect with the collection of Fiji resorts they recommend as well as to assist clients with on-the-ground support, as well as off-the-beaten-path locations. Tailor Made Fiji specializes in Honeymoon, Dive and Family travel to Fiji. Tailor Made Fiji was started by Natasha a year after moving to Fiji to live with her husband who had already spent four years living in the country building and starting a resort of his own. Natasha was constantly asked by visitors to make recommendations on places to stay, eat and adventures she’d recommend for their Fiji travels. With a history in the travel industry spanning more than 15 years and now with Fiji as her permanent home Natasha saw the opportunity to design custom Fiji travel experiences for Fiji weddings, honeymoons, diving and family travel. Natasha lives and resides on Vanua Levu with her husband and two children. Savusavu Hot Springs Hotel is a 4-minute walk from Nawi Island, a 7-minute walk from a bus station and a mile from the Hot Springs. 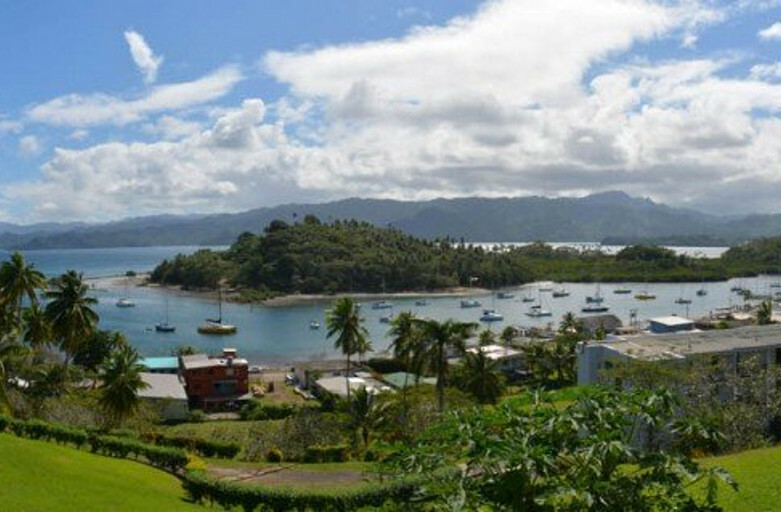 Savusavu is Fiji’s most picturesque and charming town. Here an eclectic mix of local, South Pacific and European influences await to deliver a massive dose of island congeniality to your journey. Whether you arrive for business, sightseeing, visiting old family or by complete happenstance, you can be sure that your time at the Savusavu Hot Springs Hotel will always leave you with memories of that indelible view and a delightful accommodation. Featuring balconies with garden views, the simple, colorful rooms have free Wi-Fi, minifridges and ceiling fans, as well as tea and coffeemakers. Upgraded rooms add air-conditioning and ocean views. Studios and 1-bedroom apartments add kitchenettes. There’s a relaxed restaurant and bar with floor to ceiling windows and a terrace area. Other amenities include an outdoor pool, a TV lounge and free parking. Thank you for your interest in the Pearl Shack. At this time we are closed to rentals due to damage from tropical cyclone Winston, which was the strongest recorded cyclone in the southern hemisphere. We want your stay to be perfect so we are busy rebuilding and hope to have the Pearl Shack ready for you soon. The award-winning Jean-Michel Cousteau Resort was voted the best 5-star all-inclusive luxury resort in Fiji and the South Pacific. Many of our guests return year after year to enjoy the unique sincerity of its authentic Fijian hospitality. The resort has been the recipient of many awards and accolades, however, the most gratifying comments are those from the many guests who have created life-long memories here. 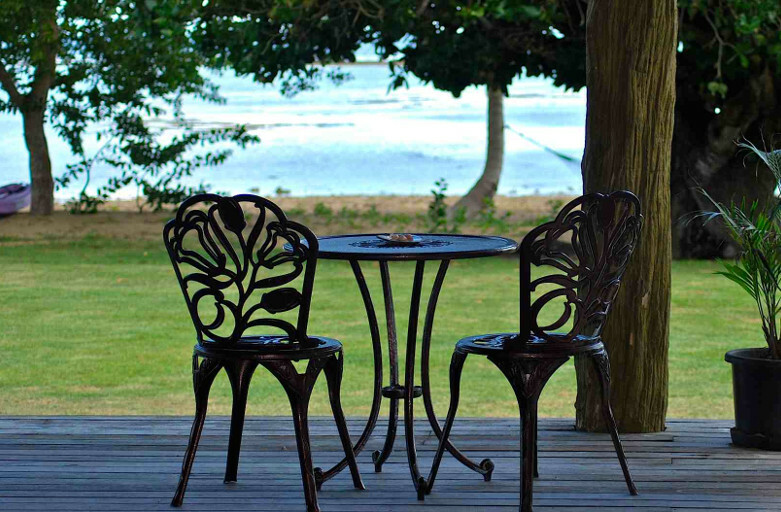 Overlooking beautiful Savusavu Bay, the Jean-Michel Cousteau Resort features just 25 luxurious bures. 5-star accommodation and service amidst quintessential Fiji island serenity. Bure is the Fijian word for a traditional thatched house. Jean-Michel Cousteau Resort was built on the site of a former coconut plantation, the lush 17-acre property features 25 luxuriously appointed bures set on the shores of beautiful Savusavu Bay, with views of the coral reefs and the mountains beyond; a quintessential Fijian setting. The bures are very well appointed with many luxurious touches including deluxe king beds, over-sized bathrooms, and private decks, perfectly designed for both couples and families. Rates include all meals, non-alcoholic beverages, round-trip ground transportation to/from Savusavu Airport, WiFi, Bula Club for Kids – a complimentary award-winning child care / educational program, and a seemingly never-ending array of exciting holiday activities and excursions. In a remote setting that defines paradise, Koro Sun Resort & Rainforest Spa immerses you in a genuine Fijian experience that’s nirvana to the core. Our northern unspoiled location offers you the genuine warmth and friendliness of the Fijian people, beautiful lush tropical surroundings, and warm, impossibly clear waters. In the unspoiled native north on “Fiji’s other big island” of Vanua Levu, this 160 – acre sanctuary was born of a nature lover’s dream. The tropical retreat is encircled by lush rainforest at the edge of a stunning private lagoon. From the moment you arrive, the Koro Sun staff embraces you like family. They greet you with a song that welcomes you to your home away from home. Certainly, the Fijians are known around the globe for being the most warm and friendly islands on earth. That hospitality – coupled with our diverse accommodations and recreations – has made Fiji’s Koro Sun Resort an international favorite for relaxing holidays, active family vacations and magical romantic gateways. Our 51 private bures and villas (bungalows) are spacious, individually appointed decor and fully air-conditioned. Your stay is all-inclusive-from airport transfers to bountiful gourmet fare and flurry of non-motorized water sport activities. Beverages are additional. Spend your day lazing on the daybeds at the waters edge, exploring the offshore reef with our PADI certified crew, fine-tunning your putting on our nine-hole pitch and put rainforest golf course or indulging in a banana leaf body wrap or coconut oil massage in our enchanting Rainforest Spa.Our adventure team will also personalize experiences away from Koro Sun. Explore Lotu Island Cave with Manu, tour botanical gardens with Leba or hike with Jone to a tumbling waterfall where you can splash in the color pools beneath. Fijian villages are sprinkled across Vanua Levu, with majestic bays cutting into its south shore and one of the world’s longest barrier reefs flanking the north coast. The island is also home to Savusavu, a multi-cultural town of 5,000 reffered to as “Hidden Paradise.” Aside from boutique resorts, tours and the mellow lifestyle of the locals, Savusavu remains largely untouched. That’s the allure of Koro Sun. It’s an exclusive respite from hectic routine that helps you regroup, refresh and revitalize amid the pure elements of nature. But all the authentic simplicity of the Fijian way of life awaits you just beyond in the island’s charming villages and lush natural environment. Set amidst 525 acres of breathtaking tropical beauty in Fiji’s northern island of Vanua Levu, Namale Resort & Spa is redefining all-inclusive. Our intimate, adults-only boutique setting offers a truly unique and authentically Fijian experience where your every request is met, every want anticipated, and every expectation exceeded. Catering to some of the world’s most exclusive clientele from actors Anthony Hopkins, Edward Norton, and Russell Crowe to fashion icon Donna Karan and NBA Coach Pat Riley, our world-class staff is devoted to providing you an exquisitely luxurious experience unparalleled by any other all-inclusive resort in Fiji. At Namale, no two accommodations are alike. Each of our luxury bures (Fijian for home) and villas feature a unique and spacious layout and authentic Fijian design wrapped in five-star luxury. Focused on intimacy and seclusion, enjoy exclusive amenities like ocean views, personal pools, replenishable mini bars, and more in your very own private paradise. Namena Reef Divers are the only dive centre that takes you to the famous ‘Namena Marine Reserve, Somosomo Straits and the Hammehead Shark Dive at Dream House’. With literally easy access to Fiji’s top dive destinations, our location makes planning your diving holiday a breeze. A PADI certified SCUBA diving operation with a fully equipped dive shop and custom- built dive boats, Namena Divers will take you to another world of vivid turquoise waters, abundant with beautiful coral, teaming with an amazing variety of colourful tropical fish. Our professional staff are able to provide introductory SCUBA instruction, Open Water Diver, Advanced Open Water, Diver, Rescue Diver, Emergency First Response, Dive Master and Specialty Certifications. For certified divers we generally offer 3 dives daily with dives to the Namena Reserve & Somosomo Straits. New diver or Pro, we offer you a truly safe, professional and friendly Fiji dive experience. You can be sure that your dive experience with us will leave you with great memories of our hidden paradise.